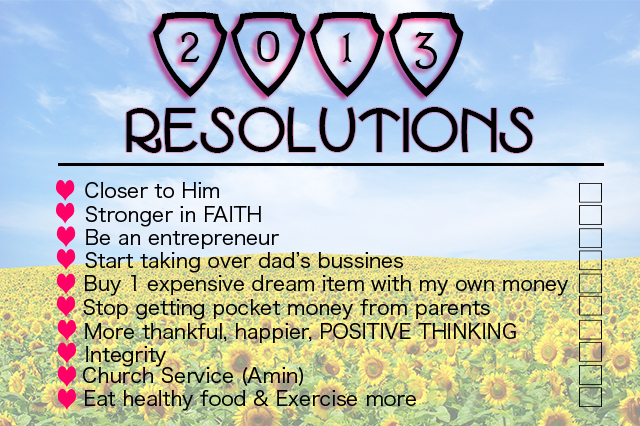 I believe that this year will be a better year and many good unexpected things will come, so i made a list of the things i've to achieve in 2013! Closer to Him, Stronger in Faith, More thankful, Happier and Positive Thinking are my top goals this year. I've been through such a rough time in 2012 but it gave me a lot of new things that i learned and start doing my lessons! I've been seeing a lot of awful things everywhere in my life and ive been wanting to do something about it. I know it takes more to "change the world", however, i believe by doing the right things (even when no one is watching) is the best things you can do to make this world a better place. It doesn't have to be big, a simple gesture towards people you see everyday is a good start. Example, be an ear to listen, be the voice of Him, share His kindness. Church Service is one of the thing i really want to do. I honestly have felt, seen, and i enjoy His grace and kindness in my life. The simplest thing that i can do to give back is by serving Him. Whatever it is, even the smallest part i'd be happy because i know He know that i'll do it from my heart. Buy 1 expensive dream item with my own money. Its not that i've never bought anything with my own money though, but i wanna save more and set a bigger scale of goal here. I wanna buy something that i've been really craving for. Right now i'm still thinking what it might be, but as soon as i get the idea, i'll do my best to get it! Eat healthy food and Exercise more, this will be quiet a challenge i gotta admit to you guys! I used to be a vegetarian (believe it or not) for like half a year before i finally gave up. Eversince then, its soooo hard to go back to that kind of lifestyle . Meat is deliciouuuuus. If you ever gonna decided to be a vegetarian, NEVER look back and eat meat ever again because it's soooo hard to stop (Or maybe its just me) But i'm gonna try my best to eat more veggies, drink more water and exercise more. Last not least... Be an entrepreneur. This one i least expected because we all know its not that easy to start a business. But, i want to at least start thinking about it, or try to visualise what i want to try to do. I don't wanna rush everything and rather enjoy the process and this year might probably the start of the process. Maybe in couple of years soon! That's all! I don't wanna set too much and ended up ticking none of the boxes! I hope everything will goes well along the way ;) We have 365 days to try to achieve everything, lets make every day count! At the end, i just want to thank my God for EVERYTHING.I believe He knows what's best for my life rather than my own self. Hopefully i will see all of these boxes will be ticked by the end of the year, amen!